The Pacman Nebula is a cosmic cloud of space gas located in the constellation Cassiopeia. NGC 281 gets its name from the classic video game character it resembles. 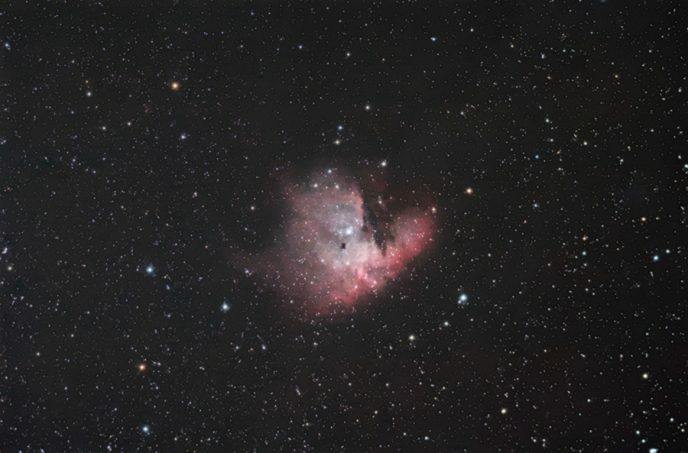 Many people think that this nebula resembles a heart, which you can clearly see in my recent image in HaRGB. NGC 281 is a rather diffuse red-glowing emission nebula. It includes a small, yet noticeable open star cluster (IC 1590) and some really dynamic dust lanes. The prominent lane of dark dust cutting into this glowing nebula creates the “mouth” of this nebulas shape. 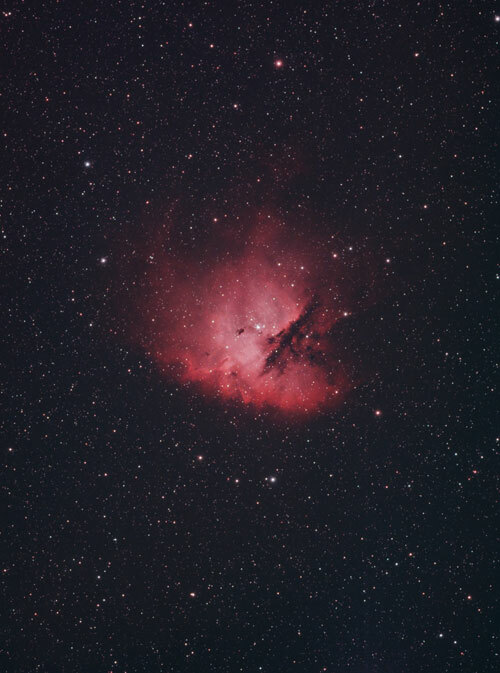 NGC 281 – The Pacman Nebula. Captured using a Sky-Watcher Esprit 100ED Telescope. The image above was captured using a cooled CMOS camera (ASI294MC Pro) through a 550mm apochromatic refractor telescope. Over 4 hours of total integrated exposure time was used to produce this image. Stacking multiple light frames together can help improve the signal to noise ratio. Learn more. The Pacman Nebula contains Bok globules, which are small and isolated dark nebulae containing dense amounts of dust and gas. These collections of cosmic gas and dust are often followed by the formation of new stars. The image scale of the camera and telescope I used for this photo is 1.73. This figure is calculated by dividing the pixel size of my camera (4.63) by the focal length of the telescope (550mm) – and multiplying that number by 206. Generally, to produce a well sampled image (not pixelated or bloated), you want to aim for an image scale of 1-2. In the video below, I explain how I will always trade sleep for a night of astrophotography. What’s one rough morning compared to an incredible deep sky image of the Pacman Nebula I’ll have for the rest of my life? In the video, I share a number of astrophotography tips to help you capture successful deep sky images on a consistent basis. One of them is to use an alignment star on your telescope mount that lies close to your intended deep sky target. This will result in an accurate pointing accuracy of the mount, and a well-centered target. Also, use that alignment star to focus your telescope as well. Since the field of view that contains your deep sky object may not contain a star bright enough to use a Bahtinov mask on, the alignment star may be your best chance to complete this step. A star alignment routine is essential for improving the pointing accuracy of your telescope mount. 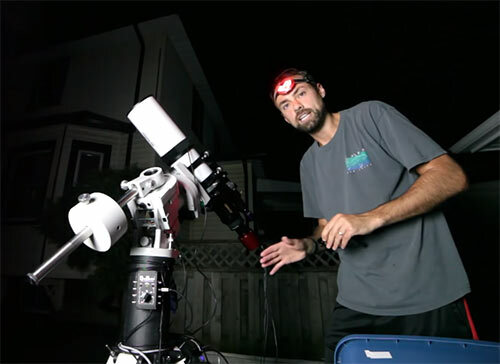 Plate solving is another method of improving the pointing accuracy of your telescope mount, but requires external software (such as Astro Photography Tool) to run. A 3-star alignment routine can be accomplished on the hand controller of modern equatorial telescope mounts. Relatively dim and diffuse nebulae such as the Pacman Nebula may be completely invisible in your field of view. The fine details and color of the nebula must be pulled forward during the image processing stage. A telescope mount that can accurately point to your target is essential for photography faint targets. I have photographed this nebula many times over the years, using a number of different telescopes and cameras. When you adjust the orientation of this region of H II region just right, you can certainly see the shape of the retro video game character. Pac-Man approves of my image. One of the reasons my latest image of NGC 281 “pops” is because I used a narrowband filter with my astronomy camera. The filter isolates the hydrogen-alpha wavelength of light in the visible spectrum. The photo below was completed using an Altair Hypercam 183C astrophotography camera Images in both true-color RGB and H-Alpha were combined to produce this 5+ hour long exposure. 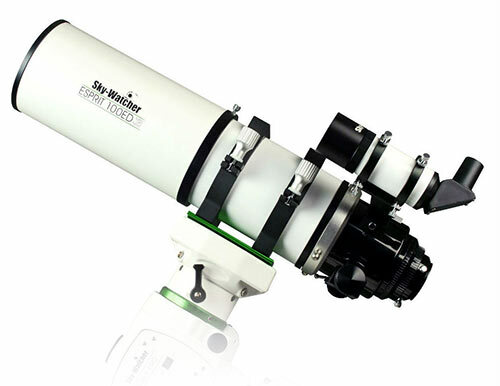 For this image, an Explore Scientific ED102 telescope was used, with an Altair Lightwave 0.8X flattener/reducer. It is nice to see this object in all its glory using my modern image processing techniques and equipment. Years back, the Pacman Nebula did not look so vibrant, as I photographed it using a stock Canon EOS 450D camera in RGB only. I was quite happy with the way this image turned out at the time, but now realize just how much signal I was missing out on. 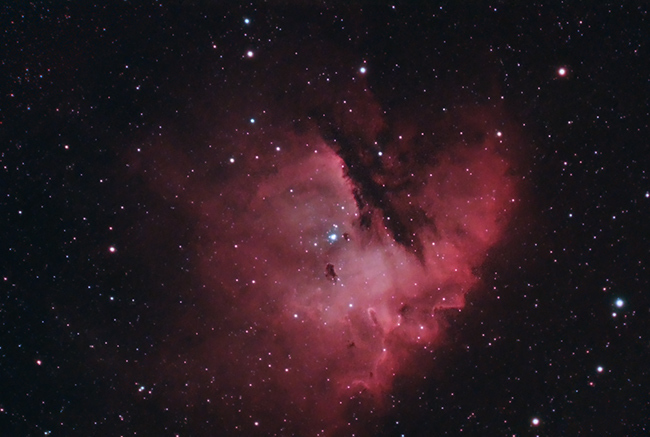 The version of the Pacman nebula seen below was captured using my Canon 450D DLSR before it was modified. It’s a good representation of what to expect with an unmodified DSLR. The Pacman nebula is a great candidate for my next narrowband Ha filter project. This area of the night sky is densely populated with stars, which can make image processing a challenge. The goal is to isolate the light transmitted from the gases in this nebula from a busy sky full of stars. The most beautiful portraits of NGC 281 are often captured using filters to separate the different wavelengths of light this nebula emits. An H-Alpha filter should do a great job at taming the sea of stars surrounding the nebula, and improve overall contrast. 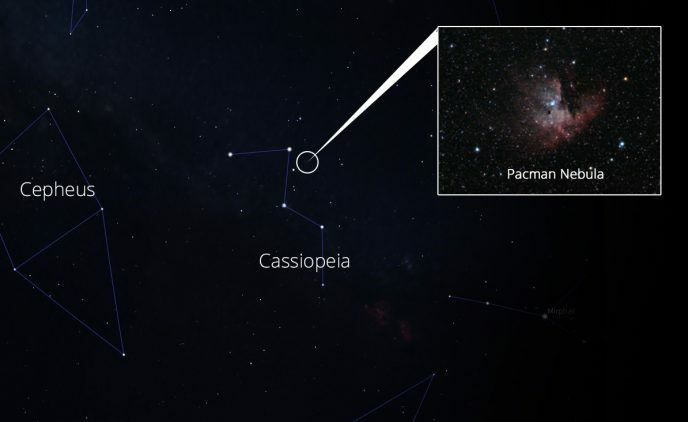 Cassiopeia is one of my favorite constellations because of its convenient position in the sky, and the sheer amount of deep-sky objects located within it. The Pacman nebula contains an open cluster of stars cataloged as IC 1590. The young, massive stars in this open cluster create the glow that light up NGC 281. A deeper view of this nebula will reveal intensely sculpted columns of nebulosity and several bok globules. 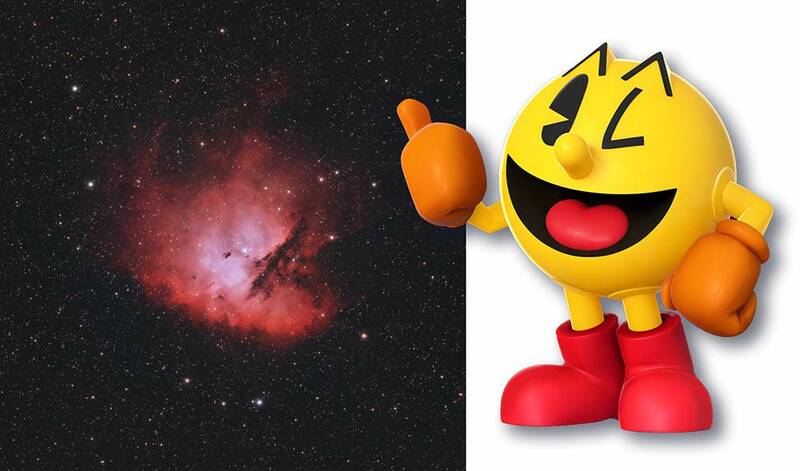 Where is the Pacman Nebula located? You’ll find NGC 281 in the Northeast corner of Cassiopeia. Locate the bright star, Shedir in the “W” asterism, and travel south to a star slightly dimmer known as Achird. This large faint and very diffuse nebula appears extremely dim visually and makes for a challenging observation. 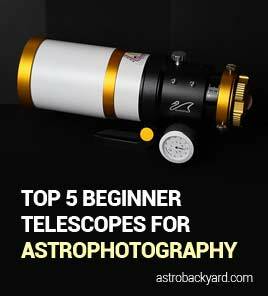 If you would like to learn more about how I go about capturing deep sky objects using a camera and telescope, have a look at the following video. I break down the core concepts of deep sky astrophotography and what I use to photograph nebulae and galaxies in the night sky.